The proton pump inhibitor PrevAcid is an effective remedy for gastroesophageal reflux disease (GERD), peptic ulcers, and heart burn. However, the medication may be associated with a number of side effects, including bone fractures, Chronic Kidney Disease, and heart attacks. 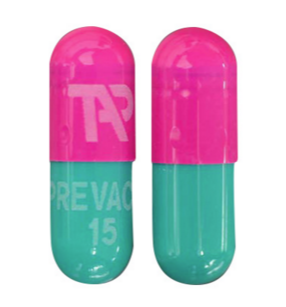 In 2009, the U.S. Food & Drug Administration (FDA) approved PrevAcid 24HR, an over-the-counter version of the drug. PrevAcid 24HR is marketed by Novartis. In June 2015, an article published in PLOS One raised concerns that the use of prescription PPIs could increase the risk of heart attacks and cardiovascular death. The authors of the report examined the medications’ use in patients without a history of heart disease in two separate studies that encompassed some 3 million people. The findings suggested that PPI medications may increase the heart attack risk by 16 to 21%, and double the risk of cardiovascular death. In January 2016, research published in JAMA: Internal Medicine indicated that patients using PPIs might be more likely to develop Chronic Kidney Disease, or CKD. The study looked at the rate of kidney disease in 10,482 patients who had been enrolled in the Atherosclerosis Risk in Communities (ARIC) study. After adjusting for variables, the authors o the report found that PPI use was associated with a 20-50% increased risk of CKD. In 2010, the FDA warned that patients who use PrevAcid and other prescription proton pump inhibitors may be more likely to experience fractures of the hip, spine and wrists. The risk appeared to be greatest among individuals over age 50, and among patients receiving the highest doses for a year or more. In March 2011, an FDA Drug Safety Communication warned that long-term use of proton pump inhibitors had been associated with hypomagnesaemia (low serum magnesium levels). In many of the cases reviewed by the FDA, magnesium supplementation alone did not improve low serum magnesium levels and the PPI had to be discontinued. Could PrevAcid be Associated with Dementia?